CITE AS: Flo Laino, "The Tower Posterne," in 100 Minories, February 12, 2015, https://100minories.lparchaeology.com/the-tower-posterne/ [Date Accessed: April 23, 2019]. Museum of London reconstruction of the Postern Gate from the London Wall Walk guide. 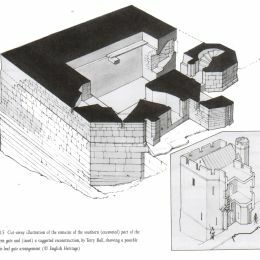 Cut-away illustration of the remains of the southern (excavated) part of the Postern gate and (inset) a suggested reconstruction, by Terry Ball, showing a possible Eagle-leaf gate arrangement. Copyright English Heritage. In today’s London, only fragmentary traces of the London City Wall remain (mostly having been torn down in the 18th Century to ease traffic flow) with one of the extant portions surviving up against the 100 Minories excavation site. Indeed, it is fairly bizarre, walking around London now to think about the scale of it as just one square mile, contained within tall, impermeable walls. For centuries the way into the City was barred by several ‘gates’ into the capital and administered by gate keepers. The principal gates which gave passage into the City included, Ludgate, Newgate, Aldersgate, Cripplegate, Bishopsgate and Aldgate, which had their origins in Roman Londoninium. An example from the 14th Century (notably before the Peasant’s Revolt in 1381), gives us an insight to a time when the gates of London were strictly controlled by two sworn ‘gardeyns’, or key keepers. However these large, grandiose gates were not the only ways in. At several points in the lifetime of the wall, there featured minor gates, or postern gates (‘postern’ coming from the Old French posterne and Latin posterula, meaning ‘back entry’), wide enough to serve only pedestrians or horsemen. These gates were formed for all manner of purposes, sometimes as a means of private entry where a residence backed onto the wall, sometimes where parts of the wall had been broken through to form an ad-hoc point of entry. Some, such as the Moorgate Posterne, ended up being extended to accommodate a large carriage entry and two footways (RCHME 1928, 97). The Tower Postern, constitutes ones of these lesser gates, situated where the wall met the ditch of the Tower of London. It was a small, but official through route into the City, fortified with a portculis. Built 1297 – 1308, alongside the construction of the Tower of London ditch, the gate was originally administered by City Authorities and guarded by the Ward of the Tower. The earliest documentary references to the Tower Postern are in relation to decrees arming the city gates with men, and orders for barring lepers from the City in the early 14th Century. However, unlike other City gates, the eventual demise and disuse of the Tower Postern is shrouded in mystery. Suffering from a substantial instance of subsidence c.1430-1440, the whole of the south side of the gate slipped 3m into the Tower ditch. Remarkably, this significant collapse in the City’s defences, seems to have gone undocumented in the City records. No complete documentary history has as yet been carried out on the Postern, and it is unclear how this collapse affected the continuing structure and functionality of the gate. 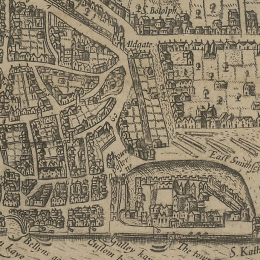 The Repertory for 1572 documents that there was still a Postern gate to be locked at this time, which suggests perhaps a repair occurred, although the gate is absent from maps of the 17th Century, for example Hollar’s map of c.1658. The relevance of the Tower Postern to the 100 Minories site, is really as a window into thinking about the nature and evolution of ‘urban’ space, on the eastern side of the City. How was East Smithfield and the land east of the city wall used; to what extent was the city wall and ditch a defensive structure or a structure for control of people and goods; at what points in time did this wider land use change and for what reason. 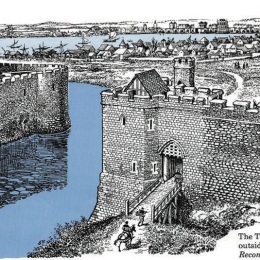 The postern is the gateway to the east, it is the junction between the “city proper” and the Tower Hamlets and lands beyond them. Whipp, D. (2006). MoLAS Monograph 29. The medieval postern gate by the Tower of London. London: English Heritage. Wyngaerde, Antony van den. (ca 1554-57). View of London. In W, Benham (1901). Medieval London. London: London Seeley. Available here.